Fenwick Landing offers adult medical day care, 2 levels of assisted living services, and short-term respite care. Our beautiful adult day care center is also available to rent for social events on the weekends. Having provided senior care for many years, we at Fenwick Landing understand the emotions that families face when making care decisions for their loved ones. Providing for a parent, spouse, or relative can be physically, emotionally, and financially challenging. Making the decision to get help is often difficult. We know that everyone does not require the same type of care. That's why, at Fenwick Landing, we offer services to those individuals who may only need daytime support, as well as those who need around-the-clock, 24-hour care. We invite you to read testimonials from our clients' family members to learn more about the excellent and compassionate care we provide. 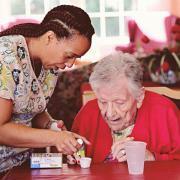 A Less Costly and More Home-Like Alternative to Nursing Home Placement. Caregiving is a full-time and sometimes stressful task. Taking a break is important to keeping you at your best, so that you can continue to care for your loved one. Plan a visit to family, take a trip, have the medical procedure you have put off, or just take some time to rest. Whether it's for a day or for a week, we are here to offer your loved one a safe and caring environment while you are attending to other important matters. Our adult day center offers drop in Respite services for families needing occasional care, or short term care. Do you have a doctor's appointment? Do you need someone to care for your loved one while you are away for the day? Then drop in respite care at our adult day center may be perfect for you. We are open Monday-Friday from 10am - 5pm, and this service is available within 24 hour notice. Just call us the day before to let us know you are coming. There is a brief questionnaire that you will need to complete, and payment is made when you bring your loved one in. That's all there is to it. Call our day program at (301) 638-4100 for more information, or to schedule a respite day. For less than $10 per hour, you cannot find a better option. Lunch is included. Our assisted living homes offer short-term overnight stays on a space available basis. Our guests have private rooms and 24 hour assistance with their care needs. Medications are administered by Certified Medication Technicians. We offer home cooked meals, and a variety of activities. Many families have benefited from this service during times when life demands attention elsewhere. Overnight respite stays may range from 1 week to 1 month. Call (301) 638-4471 to find out more about this option. We also offer short-term medical recovery stays for individuals just coming out of the hospital or who have just had surgery and need a place to recuperate before going home.